Ostrich-plumed hats of the Knights of Columbus and the peacock-plumed hats of a Latino dance troupe weren’t on the minds of Glenmarians who scouted a home for a new mission back in 2010. 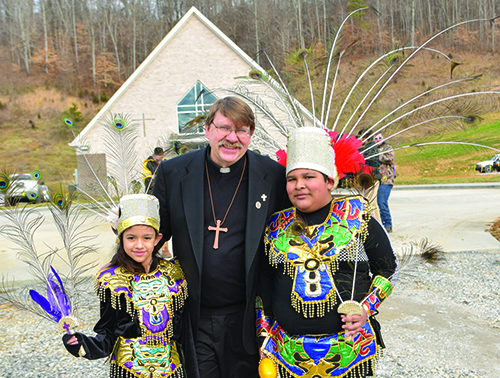 But Feb. 2, at the dedication of St. Teresa of Kolkata parish in Union County, Tenn., the celebratory feathers were everywhere. 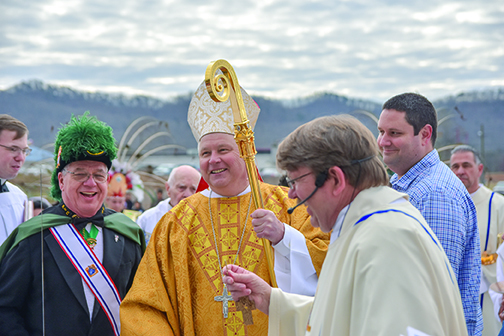 The Maynardville congregation gathered under the leadership of Diocese of Knoxville Bishop Richard F. Stika to celebrate a series of ancient Catholic rituals unique to the Mass of Dedication. It was the centerpiece of a three-day celebration. “You know, each of the three days had its own special moments and special meaning,” says Glenmary Father Steve Pawelk, pastor. “For me the best part, overall, was to see the joy on people’s faces, their sense of accomplishment, and that they really own it. They took pride showing that to their friends. That’s where there was great joy for me.” It was a climactic moment for a group of Catholics who had devoted eight years of effort establishing a parish. 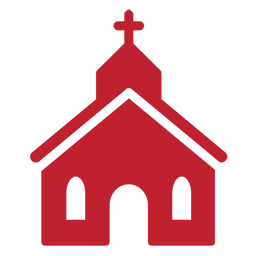 They studied the situation in and around Union County, visited organizations in that and surrounding areas and listened to anyone willing to talk. “We told them we were considering starting a Catholic church and inquired whether there was a need,” explains Father Don. They were encouraged by the conversations. Though Maynardville is fairly close to the outer rings of Knoxville in one direction, in the other is rural territory. Glenmary wanted to find a location where several parishes could be developed. Maynardville fit the bill. Father Steve was pastor from the beginning. He presided at Mass first in a carport until the parish could become situated in a local storefront. It remained there for years until this new, permanent church, was built. The building’s construction was a labor of love for the community. Skilled workers who are members of the parish helped with construction. For example, says Father Steve, some families have bricklayers. “One of our parishioners is a flooring professional. He brought in 20 different tiles to choose from.” A selection committee was put to work. Father Steve was the tiebreaker. A group of volunteer carpenters from Ohio dedicated time at a key point in construction. Contractors were involved throughout. It was a dream-come-true for Father Steve. The result is a truly beautiful, new, Catholic church. The crowded storefront days are over. A church dedication is a ritual event whose actions publicly identify the church building as a sacred space. The local bishop performs key actions during Mass, which is celebrated by the whole community. The day before the dedication Mass, frantic last-minute details were wrapping up. Brother Joe had finished the altar and was painting the aperture, which is a small hole drilled into the altar. There the bishop would place a relic of St. John Neumann, a missionary to the U.S. and later Bishop of Philadelphia. Flowers were being situated, and vestments were being brought from St. Teresa’s storefront church by Glenmary Deacon Richard Toboso (to be ordained a priest this spring) and Novice Willy Kyagulanyi. Parishioner Walter Stone was finishing up landscaping and parishioners from the Mercado family were doing brickwork on the permanent entrance sign as parishioner Martin Shafer (“The Sign Guy”) put up a temporary one for the event. A dump truck pulled down the driveway unloading gravel for mud-free passage. Final paving of the driveway has awaited the end of construction. Friday evening the parish hosted a Gospel sing, when people got a first look at the finished church interior. Several country-style singers led parts of the program. This is Tennessee, after all. A children’s choir from Knoxville’s St. Joseph school, where some parishioners attend, was one of the evening’s highlights. 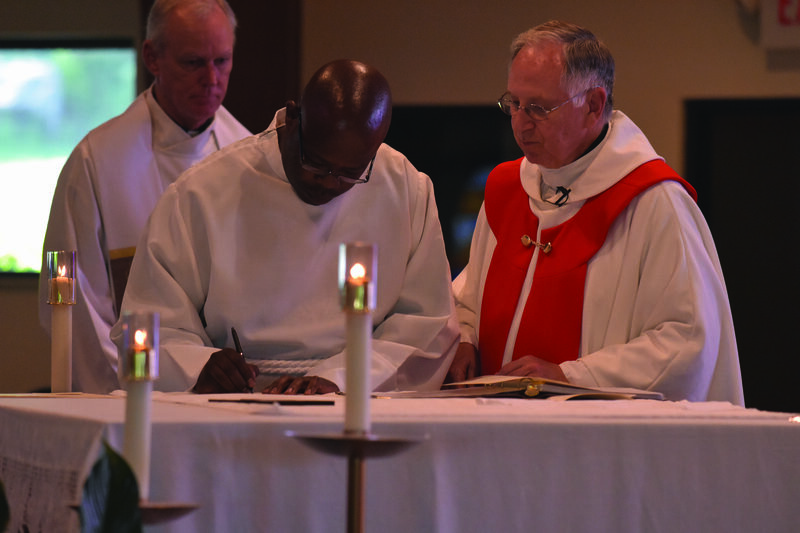 Saturday’s Mass of Dedication was a festive event, one that reflected the cultural diversity of the region. Among those at St. Teresa of Kolkata’s parish are people who have lived in Union County most of their lives, living alongside Knoxville retirees, nearby tourists who built houses at local resort Norris Lake and “halfbacks,” retirees from the North who found Florida too hot and settled halfway home. Then there is a booming community of Latinos, who came to this area for agricultural and manufacturing jobs years ago and settled with their families. Like European immigrants of yesteryear, they are hardworking, upwardly mobile and deeply Catholic. Father Steve clarifies that the dance is fully Christian. Cross-bearer Brother Craig, Bishop Stika, deacons and visiting priests processed beneath plumes and swords. They stopped at the front door of the church, which was locked as a symbol of newness. The bishop knocked. Father Steve opened the door and invited the bishop in. The people gathered began to sing. There are many elements of liturgy that followed. A blessing of the altar, walls and people with water drawn from the baptismal font happened early. There was, of course, a litany of the saints, and candles lit from the Paschal candle, signifying the Light of Christ. During the liturgy Bishop Stika carefully placed the relic of St. John Neumann deep into the spot on the altar Brother Joe had so carefully prepared, then, with a loud, decisive strike, used his ceremonial hammer to place the cover. The bishop poured the oil of chrism, which is blessed at the cathedral, over the altar and worked it into the wood with his bare hands. He then proceeded to anoint appointed places along the inside walls all the way around the church. Plumes of smoke arose as the altar, bishop, people and walls of the church were incensed. 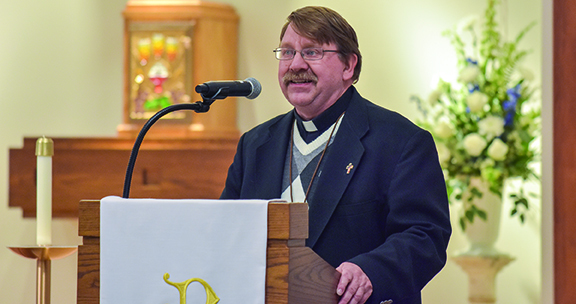 Bishop Stika was effusive in his homily, marveling at the dedication and generosity of Glenmary, and the outpouring of effort and goodwill in the community. It was a long liturgy, but no one seemed to mind! Father Steve sees a lot of potential for growth beyond the current 300 members. “There were a lot of Catholics who live in the area whose friends brought them along to see the new church. I’ve had people tell me, ‘When you get a church, then I will come.’” He is hopeful. One might think it’s time for Glenmary to move on. Not so. Says Father Steve, “This marks that we’re kind of halfway there now.” Financial independence, stronger local leadership, these are next. “But to watch the community grow and change and develop and take ownership for this! It’s amazing for a community to accomplish this in such a short time, under eight years.” He speaks as a proud father. This story first appeared in the Spring edition of Glenmary Challenge magazine.